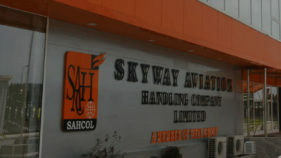 Skyway Aviation Handling Company, SAHCO Plc, Monday concluded arrangement to divest 49 percent of the company to the investing public. The divestment, which will take place in phases, has set sail with the signed offer documents for the floating of an Initial Public Offering (IPO) of about N1.9 billion, the first in the capital market after four years of primary market lull. Alex Okoh, director general for Bureau of Public Enterprises (BPE) at the signing explained that during the privatisation of SAHCO, the agreement was that 49 percent of the shares should be sold to the general public. “We are happy that the company is now offering these shares to the public so that many Nigerians will partake in the ownership of the company. It is better for many Nigerians to own the business. We are also happy that the current shareholders have been able to turnaround the entity. So we implore Nigerians to partake in this offer,” he said. The company which was privatised in 2009 and acquired by Sifax Group would be raising the fund by way of offer for sale of 406,074,000 ordinary shares of 50 kobo each at N4.65 per share. The offering is being undertaken to enable the current shareholders divest part of their stakes in the company. Also speaking at the signing ceremony, Taiwo Afolabi, chairman SAHCO said: “Based on the terms of the executed Share Sale and Purchase Agreement (SSPA) in respect of the privatisation of the erstwhile Skypower, the shareholders of the company are obligated to divest 49 percent equity stake in SAHCO to the investing Nigerian public, with 10 percent of the shares to be divested, sold to the staff of the company.